To qualify a dealership must demonstrate excellence new vehicle sales, certified pre-owned sales, customer service and satisfaction. Points are awarded for parts sales, following proper operating standards, and overall facility excellence. Only when a Volkswagen dealership is able to meet the criteria will they be able to join the prestigious Volkswagen Wolfsburg Crest Club. “The Wolfsburg Crest Club Award… is a very special award and very prestigious,” said Scott Bell, Volkswagen of America and Regional Vice President of Volkswagen of America. “It’s only awarded to a few dealership that hit certain requirements to get there. “Let me brag about you from a customer experience stand point. The numbers out of here are just outstanding. We survey our customers… the results are in. You guys scored a combined number of 97.5,” he added. Out of 650 dealership nationally, McKinney Volkswagen is in the top 10! “On behalf of the Volkswagen brand, congratulations on your exceptional performance in 2018. Your hard work and dedication has paid off, and we would like to thank you for proudly representing our Brand with high levels of sales performance and customer satisfaction. You have earned membership in an elite group, the 2018 Wolfsburg Crest Club.” Derrick Hatami, Executive Vice President of Sales, Marketing and After Sales for Volkswagen of America. April 4, 2019, McKinney Volkswagen hosted a special celebration and luncheon. Scott Bell, Regional Vice President at Volkswagen Group of America presented the elite Wolfsburg Crest Club honor. Special guests included executives from Volkswagen Group of America, members of the McKinney Chamber of Commerce, the McKinney Volkswagen award-winning team, as well as the special edition 2019 Golf Rabbit GTI. Jonathon Crouch – Congratulations for achieving sales person of the month for the past 4 months. 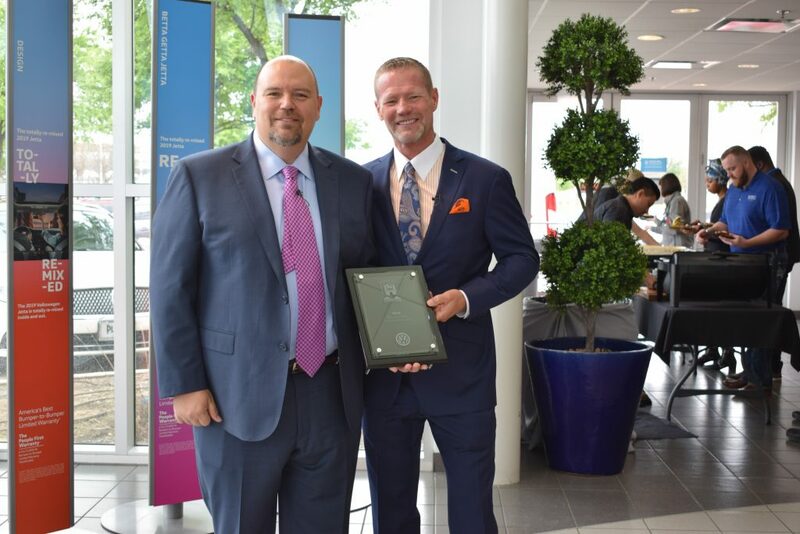 Brandon Hill – Multiple-year Generation award winner, Master Certified Advisor and Our #1 Service Advisor. Mike Knowles – Master Technician celebrating 40 years with VW. Wolfsburg Crest Club Award and Customer First is a prestigious recognition given to Volkswagen dealers who provide incredible sales and service. Dealers must meet the highest expectations in order to earn this award. McKinney VW is one of only three dealerships in the Central Region to achieve this honor.